Yesterday was grooming day for me. Even though my hair wasn't that long, mom decided to trim me so I wouldn't get over heated in the type of weather we have been getting (low 30s). 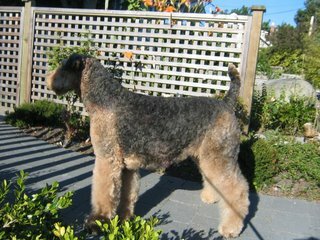 I have a lot more hair and a much thicker coat than most Airedales because of my coat texture. My hair also grows at an amazingly fast rate, so I need my hair cut every 4-6 weeks or I turn into a woolly mammoth. The picture below was taken back in April, 6 weeks after my hair cut. Just look at how much hair I grew in a 6 week period!! This was only mom's second time grooming me herself, so it took her a good four and a half hours to finish grooming on me. 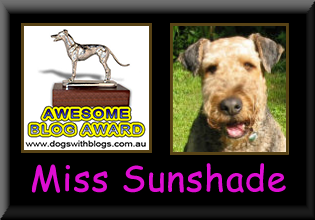 I used to go to a groomer who made me look very beautiful everytime. However, I HATED going there because they always wanted me there for at least eight hours, and they always put the big, loud, scary wind blowing thing infront of me after I was bathed. So everytime I saw mom pull into the parking lot of the grooming place, I put on my brakes and absolutely refused to get out of the car. Mom ended up having to carry me into the grooming place. Once I realized there was no turning back, I gave mom that heart wrenching "look" (to make her feel guilty) and followed the groomer to the back. Well, I guess my trick or "manipulation" worked because mom said she just couldn't stand having to bear with that "look" anymore. YIPEE!!! 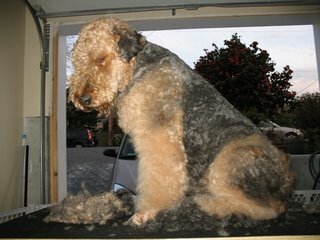 http://www.airedaleterriers.org/articles/haircut.html - this is an excellent site with step by step pet clipping instructions along with photographs to demonstrate the steps. Mom chooses to clip me because I'm not a show dog, and mom doesn't see the need for me to have to endure hours and hours of stripping on the grooming table. A clipped coat however, is usually lighter in colour and softer in texture. 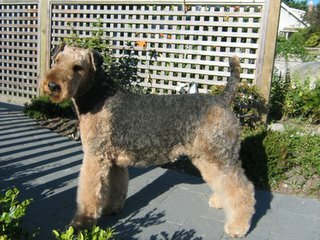 I have been clipped all my life, but look at me, am I not still an attractive looking Airedale in a different way?? I am so happy mom has decided to groom me herself and I wish she had done it ever since the beginning. Even though mom's grooming is far from perfect, I am much happier this way. Mom knows I don't like loud blow dryers, so she brushes me up and bathes me the day before and lets me air dry. When I get tired from standing, mom lets me lie down while she works around me. I, of course, am a very cooperative, well behaved girl, and I usually try my best to do whatever mom asks of me. Mom also takes me to the park for a well deserved break in between grooming. Mom's camera ran out of battery yesterday after grooming so she couldn't take pictures of me. You can kind of see what I look like in my next entry.